An American in Moscow: The River Flows, but Should It? The River Flows, but Should It? Moscow never sleeps; apparently, the same is true for the Moscow River. It has been colder than usual in Moscow. The 2010 high thus far has been 25 F (-4C) and it has been much colder recently. 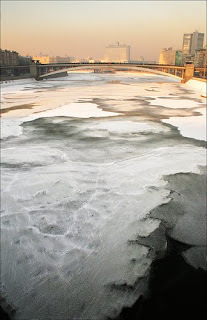 I have seen Moscow River completely frozen in warmer days but, despite the bone-chilling temperatures of late, she has been flowing lately. I asked several people about this phenomenon; the most clever and cavalier answer was "it's not water, it's milk." There are, indeed, a few peculiarities about Moscow's water. It has a very distinct taste; I have been warned by locals several times not to drink it. Bottled water is even bigger business in Moscow's restaurants than in the US eateries. If you were to ask for water from a waiter, the follow up question would be "with or without gas?" Both option always come in expensive bottles. Tap water is not an option. And my formerly white undergarment is now gray precisely because I have been washing them regularly. I do not know whether Moscow's water has its characteristics because it is full of innocuous (or perhaps beneficial) minerals or because it is polluted; locals' warnings point to the latter. Russia is an incredibly rich country in many aspects, including abundant natural resources like water. I wonder whether Russians are too cavalier with their stewardship of their natural richness, as the "it's not water, it's milk" answer suggests. In 1969, the Cuyahoga River caught fire in Cleveland, Ohio. It took a shock like this to motivate Americans to demand the Clean Water Act of 1972. I am hoping that Russia moves more proactively than we did to make sure that rivers flow only when they should. You only have one undergarment? It is 7 January. Merry Christmas.